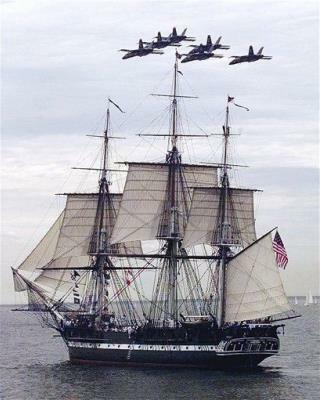 (Newser) – The world's oldest commissioned warship will sail under its own power for just the second time in more than a century to commemorate the battle that won it the nickname "Old Ironsides." The USS Constitution, first launched in 1797, will be tugged from its berth in Boston Harbor on Sunday to the main deepwater pathway into the harbor. It will then set out to open seas for a 10-minute cruise. Nail to the mast her holy flag, Set every threadbare sail, And give her to the god of storms, The lightning and the gale! A ten minute sail? They wouldn't have time to hoist any sails to go anywhere in that amount of time. I wonder if the builders of the USS Constitution knew how well they did in building this ship. Would they be amazed that 215 years after launching her, she would still be commissioned as a warship in the US Navy?